Once upon a time, when a new Jackie Chan film made it to the U.S. theaters it was pretty big news. 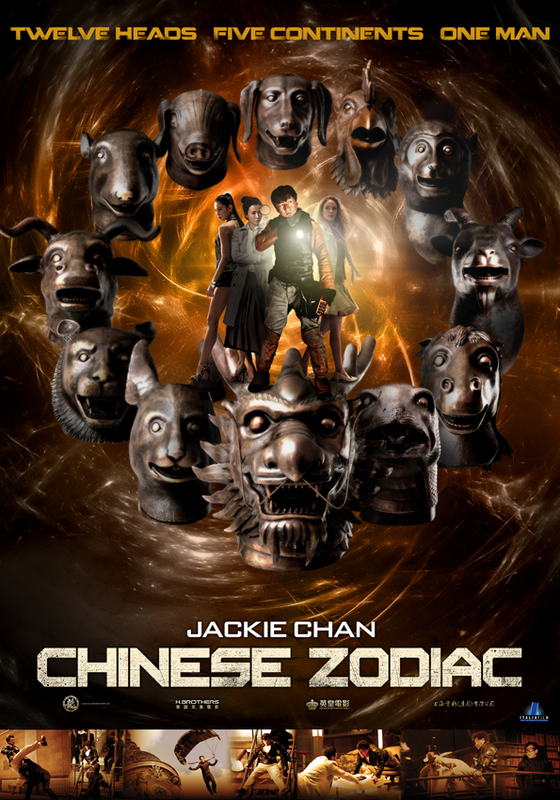 Imagine my surprise that Chinese Zodiac was directed, co-written and stars Jackie Chan. There hasn't been much as far as marketing of this film in the States. The film though was actually released in Hong Kong December of 2012. Even so, you would've expected more exposure for what Jackie calls his last action film. 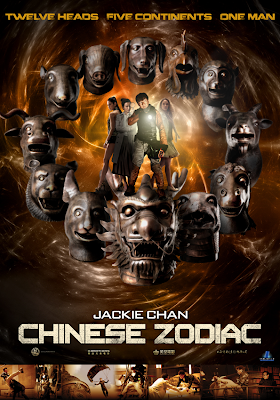 The movie as noted before stars Jackie Chan as the lead, JC who is a relic hunter. Along with his team, they find or steal if need be, national treasures, famous artworks and such for a group of unscrupulous dealers. The focus of this story however are the bronze heads of the twelve Chinese zodiac animals long stolen from foreign invaders of a palace in imperial China. The movie starts off with a chase scene which was typical of a lot of the Hong Kong films in the 1980s like Aces Go Places. But from there, sloppy editing and poor English dubbed dialogue made a lot of the film difficult to understand and enjoy. For example, not much details are given to the background of JC's team. A team which includes notable Asian actors like Korean actor Kwon Sang-woo (Simon) and whom they later meet French actress Laura Weissbecker (Catherine). 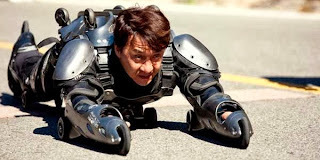 But of course with any Jackie Chan action film, what really matters are the comedy and fight scenes. The comedy suffers because of the poor English dub and absurd plot, but the action is definitely there. The beginning chase scene is pretty cool as well as the sky diving chase scene near the end is amazing. As for the fight scenes, Jackie still impresses as JC when taking on the Vulture, a rival relic hunter. And not to be upstage, JC's teammate Bonnie (Zhang Lan Xin) taking on Vulture's girl, Katie (Caitlin Dechelle), is some of the best choreographed fighting I've ever seen between two females. Overall, I would not recommend watching it in theaters unless you're really a big Jackie Chan fan. And even then, go in with low expectations. The film is very typical of his old films but just not as polished as you would hope. 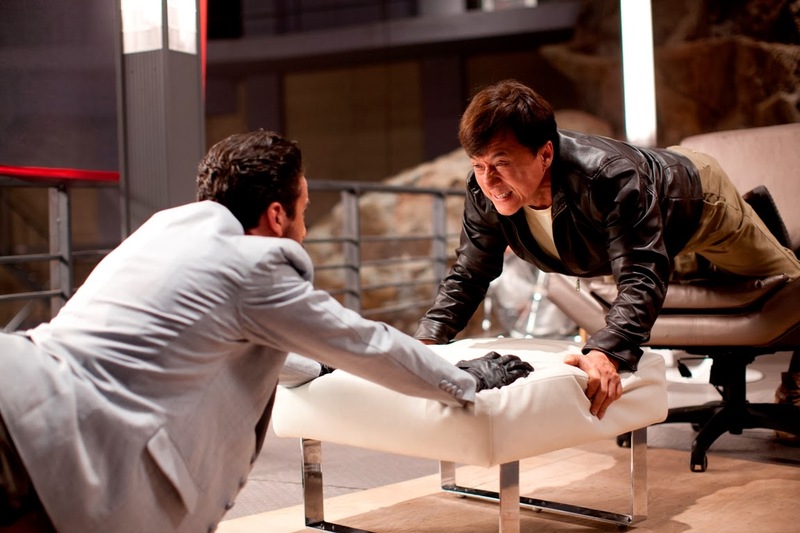 The action and fight scenes are amazing, as well as the gadgets that Jackie and his team uses. But if you can understand Chinese, I would wait for the blu ray/DVD version to watch it in its original language with English subtitles for more enjoyment. If you do watch the film, there are quite a few cameos towards the end which was a pleasant surprise. As with all of his action films, stay for the blooper reels during the credits. Rating: 2.5 Stars out of 5.0 Stars.